Note: Angel Profiles is a bi-weekly column appearing on AlleyWatch. 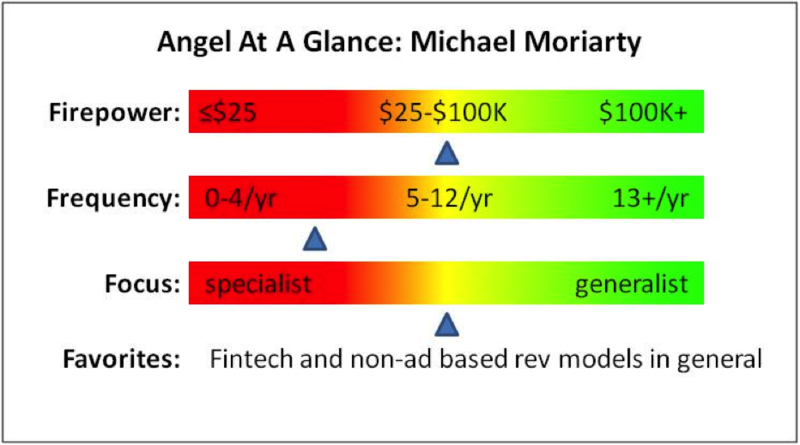 Michael was actually the 2nd angel I interviewed but, due to an unfortunate confluence of circumstances, his profile was not published until now. Sorry, Michael for the delay. Here’s the original article. Originally it was from a personal asset allocation perspective. I had the obvious equities and fixed income but had a big hole in private equity and startup type exposure. I was really driven initially from that but I didn’t foresee how much I would enjoy talking to startups both pre- and post-investing, being a sounding board for them. So it’s now really asset allocation plus intellectual curiosity. When/What was your first angel investment? How did it turn out? TiqIQ is Ticketmaster meets StubHub meets social media. They have done a great job of being the ticket portal for sports team’s blogs. Fans with extra tickets can sell to just other Phillies fans or can make sure they don’t have to sit next to a Mets fan. Now they are getting into music and smaller venues and niches (e.g., indie folk music) where the social element can help you identify concerts that you really want to go to. I invested in the seed round and my note converted when they closed their A round. I invested a little more in that round as well. It’s going well so far but the story is still being written. My most recent investment is Windowfarms, an indoor, hydroponic herb garden that you can hang vertically in your window. It’s very much non-tech but is very exciting and was written up in the Wall Street Journal a few months ago. It goes back to how I think about things. I get making something, selling it, making a profit, and trying to do it as many times as possible. I can’t poke holes in something like this. Also, there was one strategic investor that it made sense to be in bed with since they could also handle the company’s backend, letting them avoid building out the infrastructure themselves. But their technology was not as good as initially billed, the customer experience was not ideal, and they proved not to have the same sense of urgency that any startup wants to have. You could draw the conclusion that you need to keep all critical infrastructure in-house even if it costs more money and time but I still think that there are times when the efficiencies gained by piggybacking off someone else make sense. In general, when you are heavily reliant on outside parties, make darned sure the founder has fully vetted that partner and that you understand why their survival is dependent on you success. Startups you backed that should have hit but didn’t / why not? None yet. It’s still early enough that they all still have a decent chance of hitting it big. Most humbling experience relating to angel investing? I am usually very self-critical but so far I’ve been lucky not to have anything too humbling. That said, going from a financial services “never talk to anyone outside for attribution” background to a world where it is all about getting out there has been a big transition. It is refreshing dealing with startups but the “Rules of the Road” are totally different from what I was used to. It has been a real eye opener. He articulated that he could not let this thing fail. The founder had a wife and kids. This was his last bite at the apple. He showed me how he had made significant lifestyle changes (e.g., his wife went back to work) to get this one last chance to make it happen. It’s one thing to look an investor in the eye but when you are with your spouse every evening and can’t afford to look her in the eye… I like that. I was discussing revenue projections with the CFO (an employee, not the founder) and he could not articulate the assumptions that drove them other than to say that “he had full confidence” in those numbers. The only thing we really know is that those numbers will be wrong, higher or lower, so at least give me the 3 or 4 high level assumptions that drive the numbers. What makes you better (e.g., more helpful, more valuable) than the average angel? I realize that it’s your company, not mine. I’m not going to be annoying; I won’t call every two weeks. To the extent that you find it valuable, I can help you think through the pros and cons of a particular strategic decision. I won’t impose my view of the world on you… but I will want to go back in six months and see how it worked out and how your assumptions held up. Driverless cars. They will be safer and more efficient because they can be in communication with the cars around them. They will know when the car ahead is breaking hard instead of just slowing down and can react faster. Also, they will know the quickest routes and automatically avoid traffic and accidents. Leave the driving to the computer and text all you want!